A common observation about Robert Emmet is that he had a death-wish, that he was in thrall to blood sacrifice and the martyrdom complex. That version misunderstands the nature of his ethical dilemma. There is a clear distinction between being a martyr and being a suicide. Suicide you choose: martyrdom has to be inflicted on you by someone else. Martyrdom is always achieved posthumously. Emmet did not wish to die. He saw himself as a serious revolutionary whose function was to be successful. At the same time, he had to be aware that if his project failed there were inevitable consequences. That does not mean that he was courting those consequences. In Emmet’s case, his dignity and his tragedy derive precisely from the fact that he had the philosophical resources to know that he was facing an ethical dilemma. He walked this fine ethical line between knowing that his death was coming, embracing it and not embracing it. He did not choose to be hanged, then beheaded, and finally to have his gory locks held up to the admiring or disapproving Dublin multitude. But he realised that there is a burden with leadership: if you are not willing to suffer the consequences of your acts, are you then being morally or ethically irresponsible? At the same time there is a further temporal dimension: while you suffer a physical death at this precise moment, you may generate a living memory that keeps you perpetually alive, in suspended animation between history and memory. Emmet’s last days occupied this charged and complex space between death, martyrdom and suicide. After the sentence of death was passed, he was removed back to Kilmainham with his legs in irons: he drew ‘an admirable likeness of himself, the head severed from the body, which lay near it, surrounded by the scaffold, the axe, and all the frightful paraphernalia of high treason execution’. Emmet understood that there were two types of death: the physical one of the body but also death by forgetting. The French philosopher Paul Ricoeur aphorises about the victims of political injustice that to be forgotten is to die again. For Emmet it was crucial that he should not be forgotten, and his speech was his defence against oblivion. Emmet ensured that his death was steeped in resonances of classical republicanism—the Senecan tradition of the death that puts the political and juridical system itself on trial. In his last letter to his brother on 20 September, he observed: ‘I am just going to do my last duty to my country. It can be done as well on the scaffold as on the field [of battle].’ His speech aimed ‘to unmanacle his reputation’ (his hands were manacled throughout his speech): he positioned it as ‘a claim on your memory’. ‘This is my hope, that my memory and name may serve to animate those who survive me.’ The future would vindicate the principles for which he died. As Seamus Deane has noted, a crucial feature of the speech is its use of the future perfect tense—the open-ended tense of nationalism. We can contrast the different tenses of nationalism and unionism: unionism preferred the past tense, spooling backwards relentlessly from 1798 to 1690 and 1641. Nationalism promulgated the future tense, scrolling forward through the teleology of 1798, 1848, 1867, 1916, 1969, to that future day when the nation would finally have come into being. This is the tense of Emmet’s peroration, a carefully crafted piece of oratory pitched not to the contemporary moment but to an ever-unfolding future, and to those who would complete and perfect his republican vision. That appeal to the future is what sent Emmet cascading down the echo chamber of Irish history. These words resonate not as words delivered from the dead past but from the living present, words that are a constant calling to conscience and judgement about the republic and where it stands now. The extraordinary resonance of the speech stems from the fact that it is not directed at the specific audience to which it was delivered. It is a speech that goes out over the dock and into the general populace. Its claim is that my ethics, my morals, my political principles are superior to those by which I am being judged. It is a Senecan speech that claims vindication in terms of superior ethics—my ethics are superior to the ethics of those who will judge me, who will condemn me to death and kill me. Emmet’s peroration is projected into an ideal, a virtual future in which the republic will eventually have been achieved. It is only when the republic will finally have achieved constitutional embodiment that his legacy will have come into its own: only then can his epitaph be written. The speech—and Emmet’s life—awaits the verdict of history for vindication, to give it meaning and closure. Because of that pitch, the speech is always contemporary. Emmet understood, too, the power of the image. Shortly after 1 o’clock on 20 September 1803, he was executed publicly in front of St Catherine’s Church, Thomas Street, Dublin. Emmet wore a plain black coat, black velvet stock, and Hessian boots, which gave him the classic appearance of the gentleman revolutionary. At his execution he was described as ‘perfectly devout and composed’. As he was forbidden to address the crowd, once he arrived at the top of the platform he simply said: ‘My friends, I die in peace and with sentiments of universal love and kindness towards all men’. He then gave his watch to the executioner, Thomas Galvin, who bound his hands (lightly at Emmet’s request) and drew a black hood down over his face. His body was taken down after hanging for thirty minutes (he died slowly because of his light frame). Because he was convicted of high treason, the hangman then clumsily severed his head with a large blade on a deal block from a local butcher. Grasping it by the hair, he held it high above the crowd, shouting: ‘This is the head of a traitor, Robert Emmet’. According to a young eyewitness, the ‘people groaned in horror and anguish’. His blood seeped into the gutter and was lapped up by dogs. The severed head and body were brought back to Kilmainham Gaol ‘and left for some time in the court of the prison where the prisoners might view it from their cells’. The bloody block was displayed for two days at Thomas Street. His staunchness ensured that he was rapidly elevated into the republican pantheon. Thomas Russell claimed that ‘There were as many tears shedding for Emmet as would bathe him and that he would be considered by the people as a martyr’. The crucial difference between the 1803 and 1798 insurrections was that the Act of Union had taken place in the interim. That of 1798 was a rebellion against an Irish government in College Green, whereas that of 1803 was directed against a British administration in the brand-new United Kingdom of Great Britain and Ireland. From the British perspective, the Union was designed to solve the Irish problem. In the characteristic British way, the principal architects of the Union (Pitt, Cornwallis) believed that the problem in the 1790s had emerged because the Irish, both Protestant and Catholic, could not rule themselves: once you inserted an impartial, imperial parliament into their internecine squabbles then the Irish would bed down under the Union just as the unruly Scots had done after their union in 1707. The cowed Irish would follow the Scots into docile, complacent and successful absorption into the Union. Emmet’s rebellion against a British administration (‘Our object was to effect a separation from England’) so soon after the passing of the Union made it crucially different to 1798. Emmet had earlier stressed to the French that seeming Irish placidity when the Union was passed was only ‘the silence of politics, under a state of persecution’. In 1803 he argued that Britain had taken ‘even the name of independence from Ireland, through the intervention of a parliament notoriously bribed, and not representing the will of the people’. 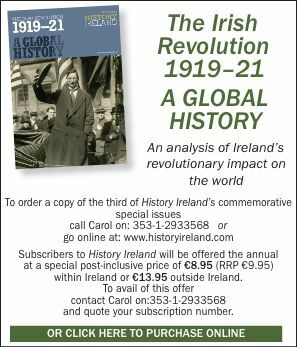 It was the challenge to this union that sent the shock waves reverberating through Dublin Castle and the London establishment: the insurrection indicated that the Irish problem was not going to be resolved by the Act of Union but might actually intensify. Castlereagh was infuriated by it because he ‘could not see the change that his own great measure the Union has effected in Ireland’. The fact that it was a military catastrophe did not matter: once again, you had Irish insurrection; once again, armed rebels stalked the Dublin streets; once again, there was the threat of a French invasion; once again, insurrection was not instigated by the usual suspects, the disgruntled papists, but by this talented and intelligent young man who came from ascendancy Protestant privilege. The 1803 rising signalled that the Act of Union, rather than resolving Irish problems, was going to deepen them. That is why Emmet resonated so much across the nineteenth century. As long as the Act of Union was in place, the challenge to it so early in its life posed a pivotal question for both Irish nationalism and British unionism. Emmet posed a ‘spin’ problem to Protestant commentators like Richard Musgrave, who did not—and, in a sense, could not—write about 1803. Because he was a Protestant drawn from the heart of the Dublin liberal establishment, literally born with a silver spoon in his mouth, Emmet gave the lie to the idea that sedition was a Catholic thing: ‘We fight that all of us may have our country and that done each of us shall have his religion’. ‘We war not against property—We war against no religious sect—We war not against past opinions or prejudices—We war against English dominion.’ Thus Emmet made it impossible to repeat the massively successful Musgrave take on 1798 as a recrudescence of Catholic barbarity of the 1641 type. Secondly, 1803 was also a complete disaster for Dublin Castle, whose shambolic performance included a catastrophic breakdown of intelligence. There were two spectacular military failures in 1803: Emmet’s and Dublin Castle’s. Fox was a complete disaster as commander-in-chief. The fact that two key leaders—William Dowdall and John Allen—escaped encouraged Dublin Castle to pin all the blame on Emmet. They did not want Westminster to know that a wide-ranging United Irish conspiracy had been hatched under their very noses. Castlereagh advised them that ‘the best thing would be to go into no detail whatever upon the case, to keep the subject clearly standing on its own narrow base of a contemptible insurrection without means or respectable leaders’. Prior to his execution, Emmet wrote a letter to William Wickham from Kilmainham, thanking him for the fair treatment that he had received. Wickham received it hours after Emmet’s death and was profoundly moved, not least by the fact that Emmet’s very last letter was written ‘in a strong firm hand without blot, correction or erasure’. Combined with Emmet’s dying demeanour, it provoked an overwhelming change of heart in Wickham, causing him to doubt the legitimacy of British rule in Ireland. Until his death, Wickham remained haunted by the ghost of Emmet. He was spooked by this message from the grave, which he showed to all and sundry: ‘For the long space of thirty-two years, it has been my constant companion’. He resigned in 1804 because he could no longer implement laws that were ‘unjust, oppressive and unchristian’ or bear the intolerable memory that he had been ‘compelled by the duty of my office to pursue to the death such men as Emmet and Russell’. Of Emmet, he said: ‘Had I been an Irishman, I should most unquestionably have joined him’. He was haunted by Emmet and the Gospel passage Matthew 6: 44–5: ‘in what honours or other earthly advantage could I find compensation for what I must suffer were I again compelled by my official duty to prosecute to death men capable of acting as Emmet has done in his last moments, for making an effort to liberate their country from grievances the existence of many of which none can deny, which I myself have acknowledged to be unjust, oppressive and unchristian’. As Wickham’s experience demonstrated, Emmet had a huge impact on contemporaries. To many, he appeared to be an ethically admirable leader who sought to minimise bloodshed. The poet Robert Southey had visited Dublin in 1801 and met Emmet’s friend Richard Curran, brother of Sarah. On 28 September 1803 he wrote: ‘If the government want to extirpate disaffection in Ireland by the gallows, they must sow the whole island with hemp’. Shelley visited Dublin in 1812, inspired by Emmet, and also wrote poems on him. Samuel Taylor Coleridge wrote on 1 October 1803: ‘Like him, I was very young, very enthusiastic, distinguished by talents and acquirements and a sort of turbid eloquence: like him, I was a zealous partisan of Christianity and a despiser and abhorrer of French philosophy and French morals: like him, I would have given my body to be burnt inch by inch rather than that a French army should have insulted my native land.’ In his notebooks Coleridge made the cryptic comment: ‘Emmet = mad Raphael painting ideals of beauty on the walls of a cell with human excrement’. It is difficult not to conclude that Emmet was the accusing ghost for a generation of English Romantics (Wordsworth, Coleridge, Southey, etc.) swinging round from radicalism into conservatism. Emmet was also portrayed in the nineteenth century as the ideal of Irish masculinity, the Irish Washington with his tight-fitting trousers, fine uniform and dashing air. He is shown as a prototype of what Irish masculinity should be. His rounded leg is determinedly thrust into the foreground: his beautiful, almost sexualised body is displayed in highly elaborate uniforms. Irish masculinity was emasculated through the nineteenth century, in the political and military spheres. Irish people were literally broken-backed, pock-marked, limping: the Irish body had become perforated, shrunken, tubercular, rheumatic—paralytic, in Joyce’s famous phrase. The whole corpus of nineteenth-century Irish literature hardly contains a single strong masculine figure. Portraying Emmet in this way made him an icon for Irish masculinity. That representation was also worked into the nineteenth-century representation of his triangular relationship with Sarah Curran and Anne Devlin, which addressed the issue of appropriate role models for Irish women. Sarah Curran functioned as the model for the Protestant gentry woman: she should be etherealised, disembodied, sublimated and desexualised. Curran was permitted the flourishes of the romantic exile in Sicily and the high romantic sense of unrequited love brutally interrupted by an external force. Anne Devlin appeared as the Catholic peasant woman who is faithful, ministering to bodily needs, a servant who is endlessly loyal. She functions as the ideal of Irish maternal femininity in the nineteenth century—long-suffering, long silent, but always standing by your man. This powerful triangulation around Emmet, Curran and Devlin provided a gender- and class-based model of Irish masculinity and femininity which has very little to do with the historical figures themselves. Emmet’s speech was always used to calibrate the republican project in Ireland. Through the two centuries since 1803, those who have contemplated the health of the body politic have been drawn to Emmet’s speech to answer the question: how is Ireland and where does she stand, how stands the republic now? These are difficult and fundamental issues: the ghost of Emmet reappears, particularly at moments of political redefinition. As long as the Union lasted, Emmet was a lively poltergeist in the political system. His rebellion occurred against a backdrop of the Act of Union, and as long as the Union was in place, the challenge to it was also in place: Emmet became shorthand for the refusal to accept that the Union was a definitive or just settlement of the Irish political situation. He appeared in an almost physical form in 1848 when Robert Holmes, his brother-in-law, was the lawyer who defended the Young Irelander John Mitchel prior to his transportation to Australia. A direct family link with Emmet has been deliberately drawn on. He re-emerged in the Fenian period in both its American and in its Irish phases: the Fenians themselves emerged out of the Emmet Monument Associations that sprang up in America in the 1850s. The 1903 Emmet centenary was a significant event, just as the 1798 centenary had been. The Irish nationalist tradition had become fractured and fractious over the Parnell issue, which was poisonous to Irish nationalist self-confidence and which divided them for ten years. The 1798 and 1803 commemorations allowed them to share a platform, however acrimoniously, again. The republican project accelerated after 1903 in the wake of the huge Emmet commemoration when 80,000 marched in the streets of Dublin. It is no surprise that Emmet was powerfully present in 1916. Patrick Pearse engaged with the Emmet legacy. He eulogised Emmet as having ‘redeemed Ireland from acquiescence in the Union. His attempt was not a failure but a triumph for that deathless thing we call Irish nationality.’ One of the reasons he moved St Enda’s up to the Hermitage in Rathfarnham in 1910 was precisely because of its Emmet association: he knew that he was literally walking in the footsteps of Emmet and Sarah Curran. When Pearse read his proclamation from the steps of the GPO, he was also self-consciously following in the footsteps of Emmet. Pearse had this enormous sense of a legacy from the past that needed to be vindicated. The last pamphlet that Pearse wrote before 1916 is Ghosts. The most powerful of these ghosts is Emmet. When Pearse entered the GPO, it was not Cuchulain but Emmet that was at his shoulder. Flying into Sydney, one flies over the white crescent of Bondi Beach, the famous surfing mecca. If you look at the clifftop overlooking it, you can see Waverly cemetery. The biggest 1798 monument in the world is located there, so big that it can actually be seen from the plane as you descend into Sydney. The memorial has chiselled onto it the roll-call of Irish republicans (because Irish republicanism is critical to the birth of Australian republicanism). Beginning with William Orr in 1797, it lists the United men, Tone, McCracken and Dwyer; then the Young Irelanders and the Fenians; then the 1916 leaders; the hunger strikers from the recent phase of the Troubles have been added. But there is a parenthesis on that monument, two brackets that come in the sequence where Emmet’s name should obviously appear. His name has not been chiselled onto the monument. His presence is there as an absence. Where is the organisation, where is the person who will take that chisel and write Emmet’s epitaph? Emmet’s presence endures as an absence, a sense that Ireland has not fully achieved what it set out to achieve. Kevin Whelan is Director of the Keough Notre Dame Centre for Irish Studies.